Teen Titans Go! Is a hilariously awesome television show that showcases the Teen Titans and what they do when they’re not saving the day. Each episode is completely random (with only a few stories spanning multiple episodes over the course of its first five seasons,) incredibly witty, and quite often simply ridiculous – but in the most entertaining way possible! Since the show is a much more immature branch off of the more serious Teen Titans animated series, our heroes are often looked down upon by other heroes in the DC Universe for their antics and how they don’t take crime fighting – or anything, for that matter – seriously enough. That’s the main focus of Teen Titans Go! To the Movies, as Robin (voiced by Scott Menville) wants more than anything to be recognized as the true superhero he believes he is by being the star of his own movie. His hopes are dashed by the Justice League, when Superman (voiced by Nicolas Cage) and the gang say that they’re just a bunch of goofsters, and they don’t have what it takes to be the type of hero that movies get made about. This leads Robin and the rest of the Teen Titans to embark on a mission to prove that they do have what it takes, be it through finding an arch-nemesis or by changing history so that their superhero competition never became superheroes to begin with. The movie is a briskly paced 84-minutes in length, but it suits the style of the show. This isn’t a serious movie on any level, which fans of the show will be prepared for. For those who may not know the show, Teen Titans Go! 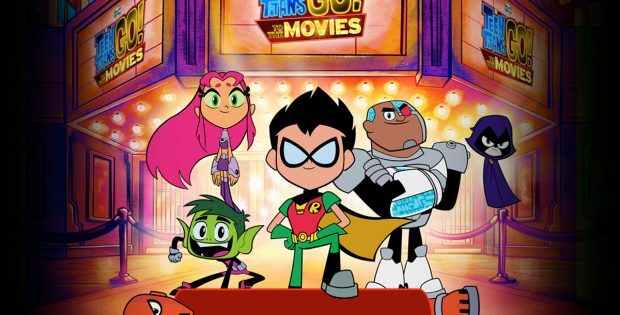 To the Movies does a good job of introducing the Teen Titans and the wacky style of the show right out of the gate with a song that has each hero rapping a little bit about themselves. It may sound silly to read that if you’ve never seen the show, but the songs are some of the best aspects of the Teen Titans Go! series, and the movie delivers some more great ones to add to the playlist! The movie also doesn’t hold back on breaking the fourth wall, taking jabs at all superhero movies, but especially focusing on the critically lambasted DC Cinematic Universe up to this point. Teen Titans Go! to the Movies mentions Marvel superheroes without a second thought, fully aware that audiences are likely more familiar with the MCU at this point, so they’ve got nothing to lose and only laughs to gain. It’s this type of humour that really keeps the movie sharp and constantly delivering laughs in ways you may not expect. The rest of the Teen Titans voice cast needs to be recognized, as Khary Payton (Cyborg), Greg Cipes (Beast Boy), Tara Strong (Raven) and Hynden Walch (Starfire) are all perfect. The five Titans just have incredible chemistry that carries over from the show to the movie, and it’s clear that they’re all having as much fun playing these characters as audiences are watching them. The hardest part about reviewing this movie is that you don’t want to wreck the surprises and jokes that happen over the course of the story, so you have to tip toe around delving too deep into things. What I can say is that the replay value is high, as the comedy is the kind that just doesn’t get old and makes you chuckle even when the movie’s over. It’s just a fun, high energy movie that will have you tapping your feet to the beats as much as it has you laughing throughout. if you’re a fan of the Teen Titans Go! TV series, then watching – scratch that – flat out buying this movie is a no-brainer! If you’ve yet to be introduced to the Teen Titans Go! series, then boy are you in for a treat! Whether you rent it first, or just skip the formalities and make the inevitable purchase, add Teen Titans Go! to the Movies to your “must see” list and then go catch up on the many seasons of the hilarious Teen Titans Go! TV show while you wait for it to be delivered. Readers GO! The animation used for the movie is definitely an upgrade over that found in the series; however, it still keeps its character charm. The changes come more in the environments over the characters themselves. Everything is bright, vibrant and full of fun. The visuals really capture the fun, purely entertainment feel that the movie strives to deliver. On the audio front, the sound effects, voices and music all work in harmony, with the songs sung by the Teen Titans really standing out and delivering the goods. The special features are somewhat lacking, as they’re more aimed towards kids over getting any real insight into the making of the movie. While it is a kids movie, I’d argue that the fanbase is large enough to accommodate both on the special features side, as interviews with the voice cast and writers would’ve been fun to see. WB Lot Shenanigans – This is a brief featurette that sees the full-sized costumed Teen Titans running around the actual Warner Bros. lot, causing some trouble, posing for pictures, all while trying to escape the security guard chasing them while zany chase music plays. DC Super Hero Girls Short: The Late Batsby – This is more a preview of the DC Super Hero Girls cartoon. It’s fun, and a few minutes long, but feels more like the start of something that abruptly finishes over a self-contained short. But it does do the job of letting audiences know how the show will look and feel, so if that was the goal, then mission accomplished. Red Carpet Mayhem – Another brief featurette that intertwines some random red carpet interviews with the characters with scenes from the movie. Deleted Scene – This is a minute-long deleted song that had potential, but if this was all they had then I understand why it didn’t make the final cut. Warner Bros. Home Entertainment Presents Teen Titans Go! to the Movies. Directed by: Aaron Horvath, Peter Rida Michail. Written by: Michael Jelenic, Aaron Horvath. Starring: Scott Menville, Greg Cipes, Tara Strong, Khary Payton, Hynden Walch, Will Arnett, Kristen Bell, Nicolas Cage. Running time: 84 Minutes. Rating: PG. Released on Blu-ray: Oct. 30, 2018.